This beguiling Cat in the Hat stands tall in an innocent pose, disguising the mischief hiding beneath. Colorfully decorated in delightful detail, this fanciful feline combines the magic of Dr. Seuss with the artistry of Jim Shore. 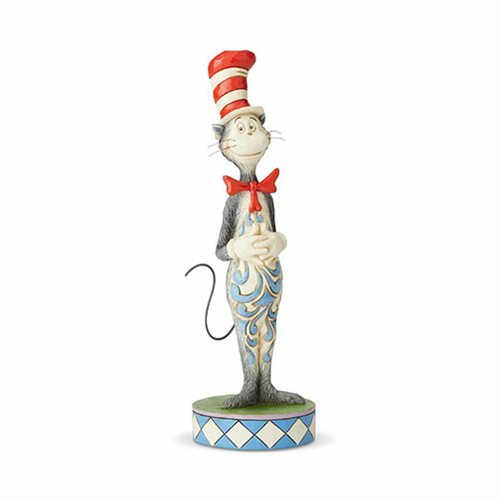 Designed in Jim's signature style applying traditional folk art patterns and motifs, the Cat in the Hat poses atop an intricately handcrafted base. This lovable design will bring whimsical fun to your collection. The Dr. Seuss The Cat in the Hat Statue by Jim Shore is made of stone resin. Measures about 9 4/5-inches tall x 3 1/4-inches wide x 3 1/4-inches long.